Whereas the party of the first part…. Welcome back to another installment of the walkthrough of All The World’s Monsters, Volume I, called by some “The Red Book Of The Land Of Oaks”. OK, no one calls it that. I just made that up. Because it’s red. And published in Oakland. Daughter Of Kali: One of a seemingly infinite number of creatures in 70s era games which existed to seduce men, steal their vital bodily fluids, and then kill or abandon them. Uhm, issues, anyone? Loosely based on Indian mythology, as if the name wasn’t a dead giveaway. Death Angel: Surprisingly, not yet another heavy metal inspired “winged dude with flaming sword and major ‘tude”, this is a giant electric jellyfish. Because of course it is. Because Old School is totally freakin’ awesome like that. Giant electric jellyfish FTW! Credited to Keith Laumer, who is brilliant, and if you haven’t read his “Retief” series, do so. Dorohime: A jellyfish with a ring of eyes and squid tentacles which is a “petty” devil (although it’s classed as a demon, go figure), that is sometimes employed as a treasure guard by assorted abyssal creatures. When killed, it explodes in a fireball. Things that explode when killed were pretty common. Dragon, Chrome: Well, of course there have to be new dragons! For every adjective, there must be a dragon! That is the law. This one… well, read it. Turns Into Any Mechanized Item. Take That, Six-Shot! Earth Mole: A “minor sort of earth demon”, filed under “E” for “Earth” instead of “D” for “Demon”, it is an albino mole with pincers and a paralysis gaze. Ebon Doom: A “demon of the outer darkness”, also filed under “E” for “Ebon” instead of “D” for “Demon, Outer Darkness, Doom, Ebon” the way it should be. 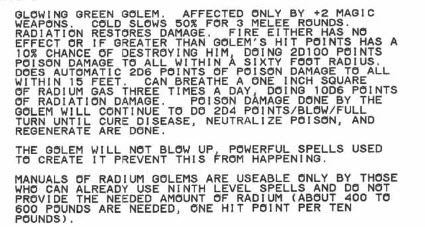 (This is what happens when a game predicated on whimsy and wonder is played primarily by the kind of people who, in 1979, were programming computers to store their monsters. People like me, in other words.) Where was I? Oh yes. The Doom, Eb… I mean, Ebon Doom, looks like a “mindless energy field”. As opposed to looking like an intelligent energy field? Huh? DM: You see a flat black energy field. Player: Does it look mindless? DM: It… it’s an energy field. It looks… energy fieldish. Player: But does it look mindless? DM: It looks like you’ve spent so much time staring at it trying to figure out if it looks mindless that it attacks with surprise. Evil Shark: Not “Shark, Evil”? Son, I am disappoint. The ghost of a low level evil cleric, it is found at depths of 80 feet, in thin seaweed. Not at 75 feet in thick seaweed! That is the domain of the Evil Crab (aka Crab, Evil, and no, I’m probably not going to stop beating this joke until it too dies and becomes some form of undead sealife), the ghost of a mid level druid! We won’t even discuss what you might find at 90 feet in no seaweed! Your mortal minds cannot grasp the horror! Ezwal: 2000 lb furry blue carnivores, with six legs. Hates machines, likes other ezwal. Based on a story by A. E. Van Vogt. Has “frost giant strength”. Should have been filed under “Ezwal, Blue”. Fiink: An intelligent.. quoppina? What the smeg is a quoppina? (Back from google.) Ah, it’s a kind of bug things from one of the Retief books. I should have remembered that. However, as a description in a general monster book intended for a wide audience, it’s a bit… lacking. Imagine if a monster was described as “a giant green Puppeteer” and readers didn’t know anything about Niven’s Known Space books. The default mental image would be… interesting. Flapfrog: This is a giant (“elephant sized”) frog with wings that allow it to glide, but not actually fly. So, wait… if it glides on them, it doesn’t flap them, does it? You don’t flap to glide. This is clearly a glidefrog, and should be under “G”. Or perhaps under “Frog, giant, gliding”. Either works. Flat: A chameleon-like blanket on the ground, which will disguise itself as whatever it’s lying on and then smother anyone who walks over it. Old School, where everything tried to kill you. Based on a story by Manly Wade Wellman. Comic from badgods.com by the excellent Lore Sjoberg. Go read more. Gargoyle, Stone: Erm… as opposed to all those gargoyles made of vanilla pudding? Geteit Chemosit: Gesundheit! This is an eight foot tall black automaton with three yellow eyes, wielding a “force axe”. If it kills you, it will remove and destroy your brain, “making resurrection impossible”, never mind that an intact brain was not required for such spells. The original raise dead (white box) and raise dead fully (Greyhawk) only discuss time limits, not corpse quality. Later editions added various other limits, but never specifically an intact brain, to my recollection (and I’m feeling too lazy to go haul out my AD&D 1e, 2e, 3e, etc. books to research this for the sake of the 3 or 4 people who might be reading). Also based on an SF story, this is from “Pastel City” (otherwise known as “Virconium”) by M. John Harrison. Unlike most of the various “based on” monsters so far, this is both a story and an author with which I am wholly unfamiliar, but apparently he’s quite well established. I Googled “Critical Mass Of Radium”. Now I’m On A Watch List. As always, if you like this site, please share it/link to it in appropriate places. 1There is also a “Daughter Of Kali, Elder”. Case closed.